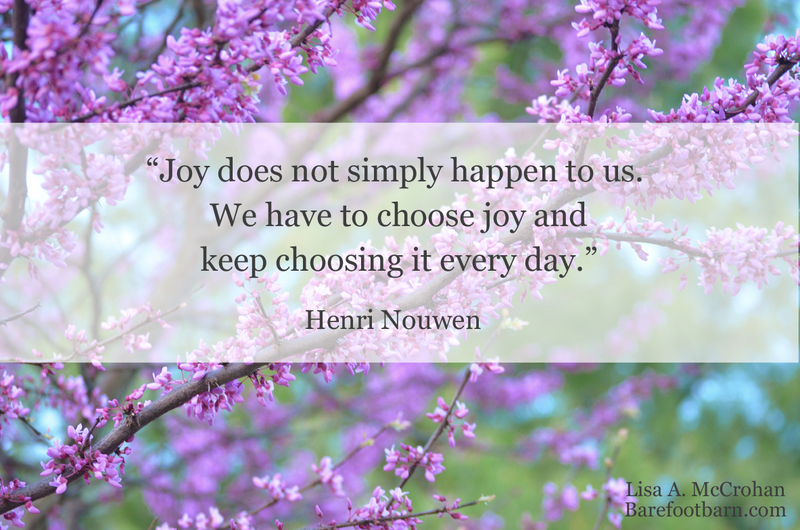 Here’s the thing about “choosing joy”: it’s not about denying anything. It’s not about “sucking it up” and putting on a happy face when we are suffering. A true joy isn’t about about faking it; it’s about cultivating the space within us for joy to arise on its own with ease. Read that again. A deep sense of joy isn’t “found” anywhere, it’s not “outside of us.” Joy “comes from a “space within us” that enables the joy within us to arise. What is such a “space within us”? 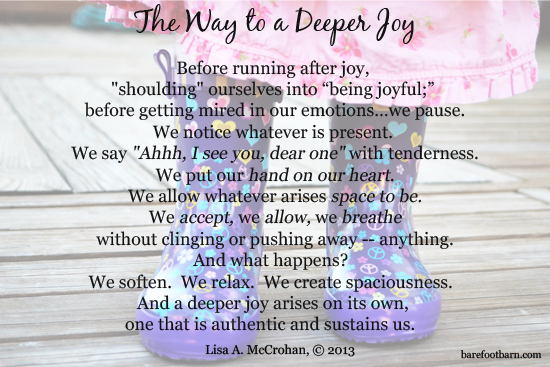 What is the way to a deeper joy? Before running after joy, “shoulding” ourselves in to it; before getting mired in our emotions…… we pause. We notice whatever is present. We say “Ahhh, I see you, dear one” with tenderness. We put our hand on our heart. We allow whatever arises space to be. Without clinging or pushing away — anything. And what happens? We soften! We relax. We create spaciousness. Insight arises. We embrace the next right thing to do…which may be taking a break from work and going for a walk, calling someone you care about and telling them, saying “I”m sorry,” buying the healthy food choice for lunch, or going to sleep early tonight. Ironically, as we accept WHAT IS — without denying anything or forcing ourselves to ‘be joyful’ – joy naturally arises. A deeper joy that sustains us. So don’t fake the joy. Create the space for it to arise on its own. On Wednesday, April 8, our Mind-Body Connections community will gather to experience a practice of reclaiming a true joy in our everyday lives. Register here for Reclaiming Joy.